Berkley. Mass Market Paperback. POOR. Noticeably used book. Heavy wear to cover. Pages contain marginal notes, underlining, and or highlighting. Possible ex library copy, with all the markings/stickers of that library. Accessories such as CD, codes, toys, and dust jackets may not be included. Penguin Publishing Group, 1980. Mass Market Paperback. Very Good. Disclaimer:A copy that has been read, but remains in excellent condition. Pages are intact and are not marred by notes or highlighting, but may contain a neat previous owner name. The spine remains undamaged. At ThriftBooks, our motto is: Read More, Spend Less.Dust jacket quality is not guaranteed. Berkley. MASS MARKET PAPERBACK. 042504744X 1981 Berkley paperback; no writing or tears in pages; store name and number inside front cover; spine crease; s . Very Good. Berkley Books, 1980-12-01. Mass Market Paperback. Good. All mass market PB's are in good or better condition. Multiple copies may be available. Berkley. Very Good. 1980. First Edition; First Printing. mass market paperback. 042504744x . Battlestar Galactica, Book 5; 0.5 x 6.8 x 4.1 Inches . New York: Berkley Books, 1980. Book. Near Fine. Mass Market Paperback. Illustrated blue cover, minor edge/corner wear, light toning. Uncreased spine. Light soil on back cover..
Berkley, 1980. Mass Market Paperback. Good. Paperback. Sound & good copy, light to moderate rubbing/edgewear to wraps. New York, NY, U.S.A.: Berkley Publishing Group A very good paperback. Small tear on cover; shelf wear. 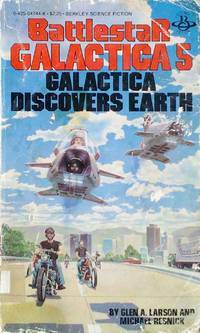 Second printing 1981. New York, NY: Berkley, 1980. First edition, first printing. Book is in fine condition with a solid binding and no marks, tears or spine creases. An Attractive Copy! Please feel free to ask me for pictures or more information, Thanks. . First Edition. Mass Market Paperback. Like New. New York, NY: BERKLEY BOOKS. Good Plus. 1980. No Edition Stated. Soft Cover. 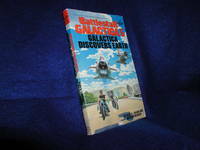 4 1/4" x 6 7/8" 042504744X PAPERBACK Galactica was trapped! A Cylon warfleet was lurking just a lightjump away. And Earth - hoplessly primitive - was completely unaware that the renegade Xaviar was rearranging history to make the planet into his private empire. 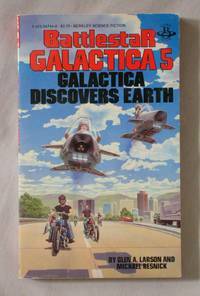 Wear at edges, reading creases, some creases on book, some soiling, rubbed, light interior browning. .
BATTLESTAR GALACTICA #5 -- Galactica Discovers Earth. New York, NY, USA. : Berkley Books Pub;, 1981. 185 pages. "A Cylon warfleet was lurking just a lightjump away.. And Earth - Hopelessly primitive!" >> Minor front cover creasing.. Second Edition. Soft Cover. Very Good to Fine. Illus. by Painted Cover Art!. 12mo - over 6¾" - 7¾" Tall.. Mass Market Paperback..
New York: Berkley Books # 04744 1st Edition , 1980 ----------paperback. 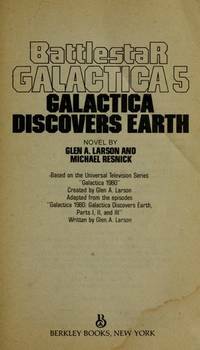 The fifth book in the Battlestar Galactica series, a TV tie-in, based on the first TV series that ran for 24 episodes in 1978-1979. Very modest shelfwear, appears unread, a near fine to fine copy.. First Edition. Mass Market Paperback. Near Fine to Fine. Illus. by David Schleinkofer (front cover). Note: our prices on Biblio are the LOWEST of any of the sites on which we list our books. New York: Berkley Books, 1980. 187 pp. Clean, well-bound pages. Wraps are creased and have heavy edge wear with surface chips. Spine cover is torn at the bottom. Remains of pocket on inner rear wrap. Solid copy for reading. 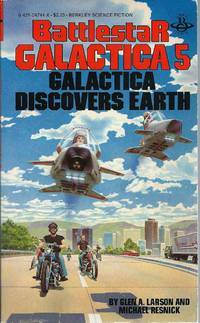 Adapted from the episodes Galactica 80: Galactica Discovers Earth Parts I, II and III.. First Edition. Paperback. Good. Ex-Library. Berkley Books, 1980. An exceptional copy, fresh, bright and square.. 1st Printing. Mass Market Paperback. Near Fine.